Brag moments, Get Cash. Nex2global Co., Ltd., a Digital Marketing Company that strives to innovate and redefine Digital Marketing introduces ​Brag It!​, a new generation of social media that gives opportunity for its users to be famous by Bragging their special moments to millions of people, to reach out with their friends across the globe, and to earn while having fun. Users of Brag It can post their best photos in the application’s Community, that will be seen by the world. Unlike any other social media (that rhymes with kilogram), being popular is easy with our Bragging Lockscreen. We provide a place for your special photos. Collect smiles (likes) for the images you have and make it to the "Best" photos of Brag It. Get featured on our Bragging Lockscreen, and earn even more! Stop sharing your photos without benefits. ​Brag It! offers a fun way to earn mobile load or cash, by just posting your images. The candy (cash point) you collected, can be redeemed for cool prizes! Get benefits by sharing your images. There are so many fun ways to earn with Brag It. You can swipe your screen, brag your photos, watch a video, and so much more! We highly recommend to explore! When you have collected 10,000 candy (cash point), you can exchange them for $5 worth of Mobile load, or Paypal cash! Brag It is not your ordinary social application. We are the new generation of social media. With our Boards and Categories, you can follow and discover awesome contents curated just for you! We do not only want you to browse awesome images, but to share your moments to millions of users anywhere around the globe! Unleash your creativity, embrace your uniqueness, redefine yourself! With Brag It, you will never be bored. Connect with millions of users across the globe by sending them hearts! Brag It wants you to share the love, and connect with its millions of users. The Heart system in Brag It lets you give out 2 Candy (cash point) and a heart, to the person at the same time! By doing so, it allows you to message them. Make distance smaller by connecting with people! The fun doesn't stop there! Brag It gives every users a chance to earn by using the application everyday as it gives out daily promos, contests, and other fun and easy activities for users to join into! It’s definitely a new wave of photo sharing that will surely add more color and fun to social media experience. 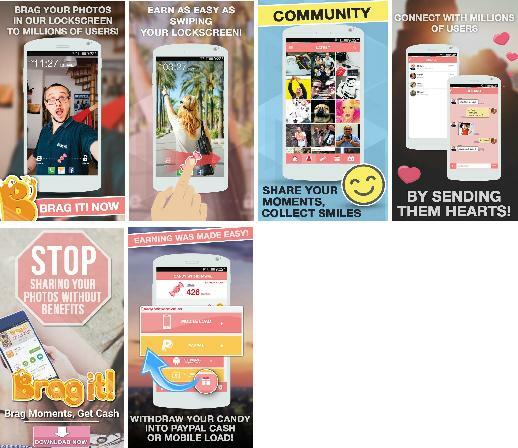 Thanks to Brag it!, people can now share their memorable moments, connect with their friends, and earn in a fun way all at the same time! Download the app for FREE now at the Google Play Store​,​ click here​! Nex2Global is an online marketing company that specializes in doing effective and efficient global marketing for mobile games and applications. They give out quality service that continuously and constantly change to make way for new and innovative processes in the market. Some of the popular projects they handled are Revolt 2, Multiplayer, Kingdom of Legend, Hello Heroes, and Baraha Tayo. Brag It! by: ​Nex2global Co., Ltd. Developer and Publisher:​ Nex2global Co., Ltd. Brag your beautiful and handsome selves by posting your selfies! Share your funny images that would make you and everyone else rolling on the floor, laughing. Highlight your best travel photos and experience. Delight others with truly amazing food images that you’d love to brag! Adore all kinds of cute animal images shared by all the users. Reveal the cool geeky side of you by sharing anything geek related images. Watch out for some feed goals with artsy images that would definitely please your eyes. Ignite the fan girl/boy in you with celebrity images all around the app. This press release was first published at www.bragitmobile.com.